Yesterday, June 15th, I had my graduation ceremony. I graduated from the American University of Beirut with a Bachelor in Business Administration (Concentration Marketing) and a Diploma in Media Communication. 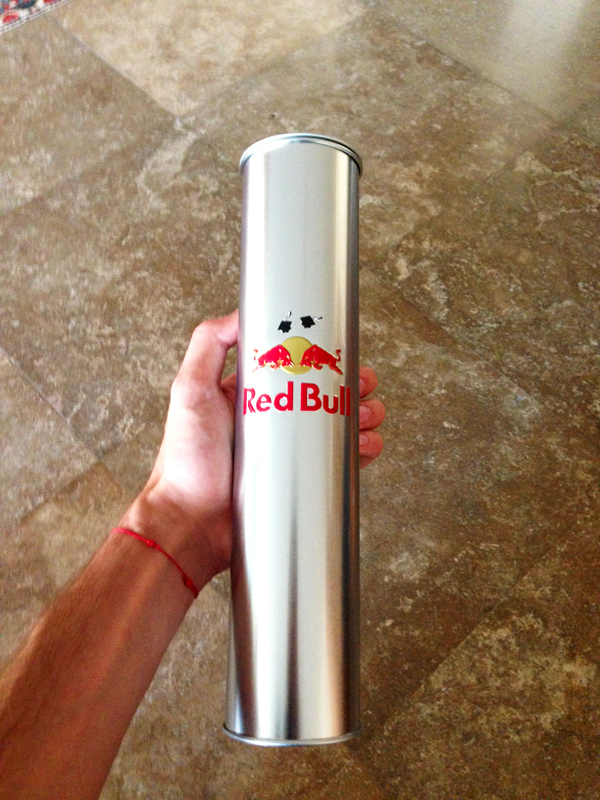 A part from all the amazing graduation emotions and celebrations, I got a really cool gift from “someone” special: Red Bull. As soon as I stepped out of campus a lovely girl came to me, offered me a long cylinder congratulating me in the name of Red Bull. A great marketing stunt. The metallic cylinder has the brand famous logo on it with two graduation caps above it. What’s inside? Two Red Bull cans, a regular and a sugar-free one, along with a really nice graduation certificate including wishes and kind words of motivation for our upcoming career. Why is this campaign efficient? First, I am sure many graduates were really happy to get two free Red Bull cans to continue celebrations all-night long. Second, it is a great way to create a relationship with recent grads who are considered to enter the market segment of young adults. Third, the certificate and personalized logo made specially for graduation purposes adds a lot of value to the giveaway and let the gift recipient feel quite special. Fourth, it turned out that there is a marketing blogger graduating there who really enjoyed the gift and decided to spread the word and write about it. That blogger is me. I am not an energy drinks consumer but I can’t deny that I really like their branding activities. A brand enthusiast who is not even a consumer is a great indicator of how great Red Bull is performing in terms of marketing. Thanks a lot Red Bull for your gift. I may not drink the cans but make sure the gift itself will give me wings!